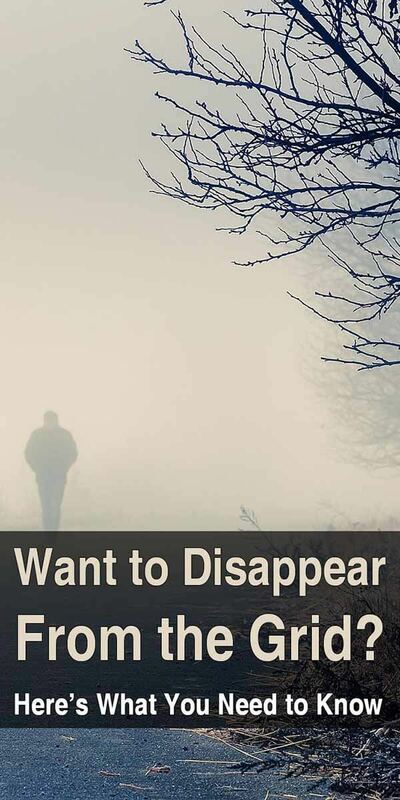 You might be thinking, “Why disappear?” There has long been speculation that the government is playing more of a role in our lives than ever. What we learned about the NSA and the inherent spying in the name freedom is that we are compromised. All Americans are compromised by the digital footprints they have created. Could it be time to erase that footprint? Now, do you still dare ask, “Why disappear?” This law can be interpreted to take someone’s rights and property for almost any reason. That’s why many people believe disappearing is the only way to ensure the security of their belongings in case of a major disaster. All this aside, you may have other reasons for disappearing from the grid. You may be on the run from abusive people, from major debts, or other hang-ups. Whatever your reasons for going off grid forever, here’s what you need to know. What is holding you in place? Are you in love, do you have family, or is there something else that keeps you in place? It all must go away, forever. Do you have that great nephew or cousin you just love seeing? If so, don’t plan on disappearing. If you want to do this properly, you must go and never come back. You must go and never contact anyone you know now. How about those people you don’t want to know? Bill collectors, IRS agents and other people you may owe money. This could be one of the reasons you are disappearing! They will be looking for you. The better move is to minimize the amount of effort and money being put towards finding you. Pay off as many debts as possible before scooting out. Unless, of course, this is the reason you are running. Step one is to ditch the cell phone. You have a human tracking device on you, always. It’s tailored to your likes and dislikes. It must go! Live in the world of prepaid going forward. This will sever one of the biggest lines hooked to you in today’s world. Avoid elaborate scenarios for your disappearance. There will be some sort of search and rescue done by law enforcement. There are very real repercussions based on these resources being used searching for a person that isn’t really missing. If you ever resurface, you could be held liable for those costs. Again, the less people after you the better. Cameras will be your worst enemy this day and age. It would be smart to spend some time out of the public eye for as long as you can before moving away from your immediate area. If you can, spend time in a hotel or a cabin for a few weeks before making your move. The reason being, investigators will follow cameras to try and find you. In theory, they could watch your entire trip out of town if you do it all in the same night. Retailers, government buildings, and basically any structure has some sort of camera on it these days. By adding a nice gap between the disappearance and the movement you will have more success. If cameras are your worst enemy, cash is your best friend. Cut your cards up today and stop using them. Anything you are going to buy for your disappearance needs to be bought using cash. When using plastic, you can be tracked at every purchase. Take as much cash out of the bank as possible each day. Do not make one big withdrawal as it will set off alarms. Cash keeps you under the radar. In your new life, this will be critical. Tattoos are the catch 22. If you can remove them, do it. If you don’t have tattoos, get some. Get a lot. Especially if you were the type of person who never wanted tattoos. Play all of the cards you hated in the past. If you are truly passionate about this disappearance, you must become someone else, and it starts with your appearance. Do you hate how you look with a beard? Grow a beard. This is the type of thinking you must nurture within you. Loved football? Now you hate it. Forget about your favorite team and all those shirts and jerseys out there. You can never come back. Understand there will be consequences. One of the most exciting parts about disappearing is that you will forge a new life in a new place. You should travel far from your home but you should also go somewhere you have never been. We leave impressions everywhere we go. Do not think your visit has gone unnoticed by all. Leave no stone unturned. Staying with the same theme we mentioned earlier, where would you never want to live? You live there now. If you hate the cold, then move to North Dakota. Disappearing is not about creating comfort, it’s about taking small steps and erasing each print behind you. Forging your new identity is another very important part of your disappearance. As funny as it may seem, your best disappearing act is in fact mostly about the reappearance of a believable persona elsewhere. When you disappear, you will resurface a new person and forget everything you were. Now, claiming to be something or someone will only take you so far. Eventually, you are going to need ID. At this point, your best option is to seek out an organization providing help to illegal aliens in America. Become an illegal alien. You will be amazed at how much help you will get and how quickly you will get an ID. Once you have a persona and new ID, you can begin building your new life. Whether you decide to dig in and have relationships as your new person will depend on who you were and how much that person is being searched for. Of course, it will better serve your story if you wind up settled and married. The more you build on your persona, the better. What you must remember is you can never go back. Don’t visit. Don’t call. Not matter what you left behind, it’s gone. This will keep you up at night, but if you are truly committed to disappearing this will be your best option. In my heart, I hope that this article has been for entertainment purposes only. I can only imagine the condition one must be in to decide to leave everything behind and disappear. Still, it’s possible to do if you think it through and make the commitment. However, it does take lots of pre-planning. Trackers (Government, skip tracers, etc.) know where you are now, prep to disappear and leave your current location as your last location. (your very last bread crumb). *If* you had to have a phone (I would not recommend it), purchase this well BEFORE leaving. Money is always a good thing, BEFORE you step off, go to your bank and drain your accounts. Tell your bank your company is sending you to (wherever exotic) and you’d like to close all your accounts. Also, BEFORE you leave go to your local cemetery to find your new identify -you’re looking for someone that was born the same year as you were born (or close to it). Finding your new identity at your new location means leaving an unwanted bread crumb behind. If you plan far enough ahead, purchase a firearm and some ammo. Well BEFORE you go, notify local law enforcement the firearm was stolen (not lost). Finally, wherever you decide your new life will be BEFORE you go, take a vacation to your new local, go there during the worst weather. How cold does it get in North Dakota in February? How hot and humid does it get in the Carolinas or Southern California? Basically, know BEFORE you go. Last but not least, if you R E A L L Y want to disappear, and you are desperate. You can join the French Foreign Legion. Anyone in the world can join (just have to get to Paris to be recruited), but you cannot join the Legion with your own legal name. But be warned, once you join the Legion, you are a slave for France and cannot leave until your 5 year enlistment has ended. The Legion is not an easy life, but of you are serious and you are desperate -well, desperate times call for desperate measures. A small suggestion to those considering or fantasying about this option: Read a book (or two) before you sail to Paris. Great tips, thanks for sharing them! Exactly what I meant! The prepaid is used and trashed until you have established your new identity and life. Also, you really shouldn’t be contacting many people in the early days of your disappearance. You will have to commit to a phone line eventually or using prepaids will send up red flags with those who come to know the new you. I’m quite sure the author is implying that a prepaid isn’t traceable as long as you follow rule#1. How can a burner be traced if you have no starting point i.e. no contact with anyone from the past? While I didn’t like the way they biased the show (seemed to make everyone go without any cash and have to go to an ATM and couldn’t get more than $100 out, log into a website they could track, etc), I was impressed with the “license plate readers” all over the place and the ability they had to “scan all envelopes” that were sent in the mail. I agree, getting rid of all your electronics is important, also do not go to any friend or family to stay for a while or stay in contact with them in any way (social media/phone/mail). Besides, what do you need a cell phone for if you are no longer going to call anyone you know? That said, if you are going to go pre-pay, buy one a year+, at a store hours away from your home, before you plan to disappear (so they can’t readily trace it back to you), and try and find one where you don’t lose the minutes/data after 30 days.